This province located in the western part of China is one that is famed internationally for its tasty servings. 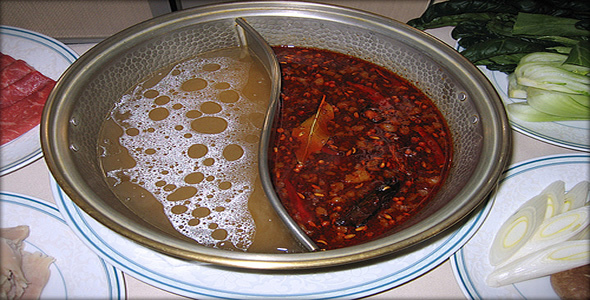 Szechuan cuisine often features bold flavors, such as extreme spiciness usually resulting from liberal use of garlic and chilli peppers, most notably Szechuan’s uniquely flavored peppercorn. This would often result in an intensively fragrant, citrus-like flavor and a slightly numbing sensation on the tongue, adding to the uniqueness of the flavor and taste. Here’s a list of Szechuan’s spicy servings guaranteed to test you to the limit. 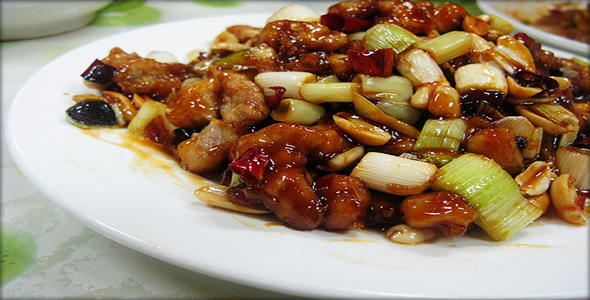 Gong Bao Ji Ding, or better known as Kung Pao Chicken, is a classic dish in Szechuan cuisine. It is named after a late Qing Dynasty (late 19th century) governor of Szechuan, Ding Baozhen, who is said to have particularly enjoyed eating it – Gong Bao was his official title. It is a medley of thinly sliced (or cubed) chicken, golden peanuts, and bright red chilies, topped up with a light sweet and sour sauce. 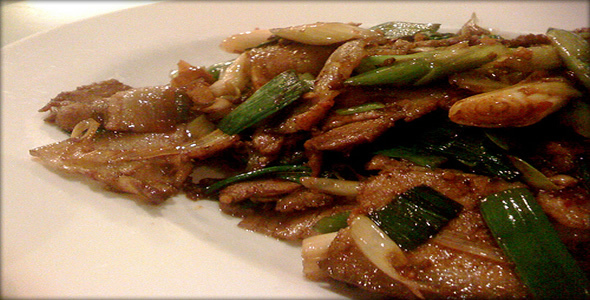 The chicken and scallion complement each other, with the peanuts adding crispiness into the dish. 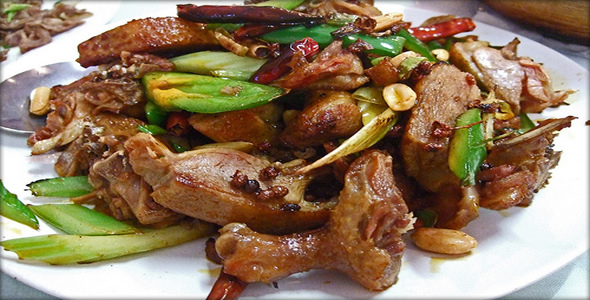 Zhangcha Duck, or tea-smoked duck, is a quintessential Szechuan dish. However, it is extremely difficult to prepare, and as such is eaten more often in banquets or festive events. The duck is first marinated for several hours, and then rubbed with a mixture of spices inside out. Following the marination, the duck is quickly blanched in hot water and dried. This ensures the skin stays crisps after frying. The duck is then smoked with black tea leaves, twigs and leaves, and then steamed for another 10 minutes before being deep fried. True to its name, this dish went through two process of cooking before being served. First, large cuts of pork ribs were boiled in hot water with slices of ginger and salt. Then, the ribs were cut into smaller portions, shallow-fried in hot oil and served with cabbages and peppers. This dish was said to have originated from the Qing Dynasty, when the Emperor Qianlong demanded a feast at one of the villages he visited. The villagers didn’t have any materials to cook with, so they dumped various leftover materials and cooked them again, which is where the term “twice cooked” came from. Mapo Doufu, or Mapo Tofu, is another uniquely Szechuan dish. It’s a combination of bean curd set in a spicy chili and bean-based sauce, topped with minced meat, usually pork or beef. It is powerfully spicy, with the dish being both hot in temperature and spiciness. This spiciness, combined with the distinctive flavor from the bean-based sauce, produces the seven characteristics that are often used by cooks to describe this dish: numbing, spicy hot, hot temperature, fresh, tender and soft, aromatic and flaky. In Szechuan, this Chinese version of the Japanese sukiyaki, much like other Szechuan variation, receives an added spiciness. The meal includes the process of cooking itself, with a simmering metal pot filled with spicy stock and various dishes cooked right in front of you. Typical hot pot dishes include thinly sliced meat, vegetables, mushrooms, dumplings, seafood and tofu. The cooked food is usually eaten with dipping sauce and rice. 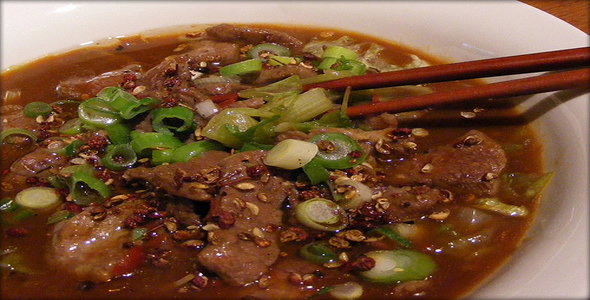 The name Shuizhu literally means “water-boiled meat slices”. 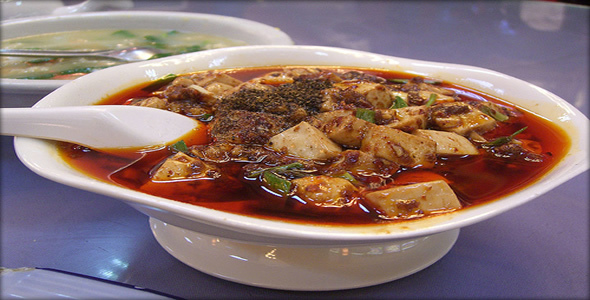 This Szechuan cuisine is slowly gaining popularity in China as well as other countries. The prepared meat is boiled quickly, only about 20-30 seconds, just enough to cook it but at the same time keep its smooth tender texture. It is then drained and served with vegetables, dried chili, peppers, garlic and other seasonings over it. Finally, it is topped with heated vegetable oil before serving. What makes this dish unique is the tenderness of the meat that is achieved with boiling instead of stir frying, combined with the freshness of the vegetables and the spiciness of the peppers.